The art of managing people is perhaps the most challenging task facing any manager. 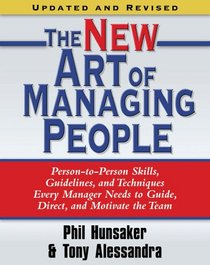 Our summary of The New Art of Managing People, by Phil Hunsaker and Tony Alessandra, explains how managers can develop effective teams of satisfied and productive individuals by creating trusting interpersonal relationships with employees. This summary of the updated edition of their management classic that has sold nearly 200,000 copies outlines an approach to the art of managing people that has become the gold standard for creating the most productive work environment possible, while still sparking creativity and ensuring profitability within the work force.